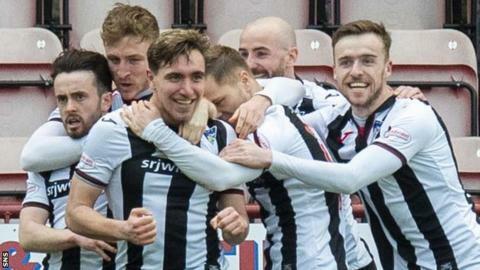 Dunfermline Athletic secured their first home win since December, and their first under head coach Stevie Crawford, by beating Inverness CT.
Joe Thomson was the goal hero for the home side with a long-range effort two minutes after the break that bulleted past goalkeeper Mark Ridgers. Aidan Connolly could have doubled their lead with a superb volley that ricocheted off the crossbar. Inverness had their chances but were unable to break down the Pars' defence. And, despite pressure in the last 15 minutes of the game, the fourth-placed side could not grab an equaliser. The win moves Dunfermline five points clear of Alloa Athletic, who dropped to the bottom of the table after losing at home to Partick Thistle, and two shy of Greenock Morton in sixth. Dunfermline Athletic head coach Stevie Crawford: "It's a nice feeling to get the win. Mark Ridgers will be disappointed with the goal, but I'll take it. "At times, there wasn't a lot of football getting played, but we stood up to it. "It's a massive lift for everyone at the club. It's a big win because you look at other results - we're now a few points below Morton and Queen of the South and the win gets us near group above us. "It's a tight league - its our first win and we probably played better in some other games, but we have a cutting edge to us now - Bruce Anderson has come in and done well." Inverness Caledonian Thistle manager John Robertson: "I'm massively disappointed. It was straightforward - Dunfermline showed more hunger, energy and work-rate in first 10 minutes of each half. "I felt they were up for the taking, but they got their goal - Ridgers should've saved it. It was mistake from him. "Then the penny dropped and in the last 15 minutes we were camped in their half, but we had chances through Brad McKay and Shaun Rooney. "It's a missed opportunity because, if we win, we get a wee gap and we start pushing above us. "We're now in a hell of a scrap with Queen of the South, Morton, Partick, Falkirk. What they've done now is give me a blank sheet of paper for Tuesday night because there will be changes." Match ends, Dunfermline Athletic 1, Inverness CT 0. Second Half ends, Dunfermline Athletic 1, Inverness CT 0. Substitution, Dunfermline Athletic. Mark Durnan replaces Bruce Anderson. Attempt missed. Joseph Thomson (Dunfermline Athletic) right footed shot from outside the box misses to the right. Attempt blocked. Bruce Anderson (Dunfermline Athletic) right footed shot from the centre of the box is blocked. Delay in match Lee Ashcroft (Dunfermline Athletic) because of an injury. Substitution, Inverness CT. Sean Welsh replaces Carl Tremarco. Attempt missed. Shaun Rooney (Inverness CT) header from the centre of the box is close, but misses the top right corner. Attempt missed. Brad McKay (Inverness CT) left footed shot from the centre of the box is high and wide to the right. Corner, Inverness CT. Conceded by Ryan Scully. Attempt saved. Joe Chalmers (Inverness CT) left footed shot from long range on the right is saved in the top centre of the goal. Attempt missed. Louis Longridge (Dunfermline Athletic) right footed shot from outside the box is just a bit too high from a direct free kick. Corner, Dunfermline Athletic. Conceded by Carl Tremarco. Substitution, Dunfermline Athletic. Ryan Williamson replaces Ryan Blair. Attempt missed. Tom Walsh (Inverness CT) left footed shot from outside the box is too high. Attempt missed. Ryan Blair (Dunfermline Athletic) left footed shot from outside the box misses to the left. Corner, Inverness CT. Conceded by Aidan Connolly. Attempt missed. Jordan White (Inverness CT) right footed shot from outside the box misses to the right. Substitution, Inverness CT. Nathan Austin replaces Aaron Doran. Attempt missed. Ryan Blair (Dunfermline Athletic) left footed shot from outside the box is high and wide to the left. Aidan Connolly (Dunfermline Athletic) hits the bar with a left footed shot from outside the box. Hand ball by Carl Tremarco (Inverness CT). Corner, Dunfermline Athletic. Conceded by Charlie Trafford. Carl Tremarco (Inverness CT) wins a free kick in the defensive half.